John and Jacklyn's Blog: Keith Urban New Idol Judge! Keith Urban New Idol Judge! Well, it's official: Keith Urban is in as the new American Idol judge. He joins fellow newcomers Mariah Carey and Nicki Minaj and veteran judge Randy Jackson. While we think it's cool (and about time!) that Idol tapped someone from country music to be a judge, we can't help but wonder why Keith is only worth a 3-5 million dollar paycheck and Nicki Minaj will pull down 10-12 mill? Hmmm. 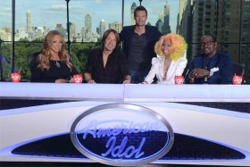 So are you more interested in watching Idol now that Keith Urban will be a judge? Email us with your thoughts: johnandjacklyn@cc1063.com, or go to our Facebook page and post there. Reverse The Call? Never Gonna Happen! The New IPhone? Ho hum.